The state Senate narrowly voted Thursday to allow two casinos to operate in New Hampshire. The surprise move by a well-known gambling advocates follows the New Hampshire House voting to allow up to 10 sports betting facilities. A bill seeking to open two casinos in New Hampshire passed the full Senate Thursday 13 votes to 10. State Senator Makes Case - Again - For Legalizing Casino Gambling in N.H. The debate over whether to bring casino gambling to New Hampshire – and the eventual rejection of any such proposal – has become an annual tradition of sorts at the Statehouse. Year after year, lawmakers have shot down bills that would legalize casinos, though sometimes by the slimmest of margins; a proposal in 2014 lost in the House by just one vote. 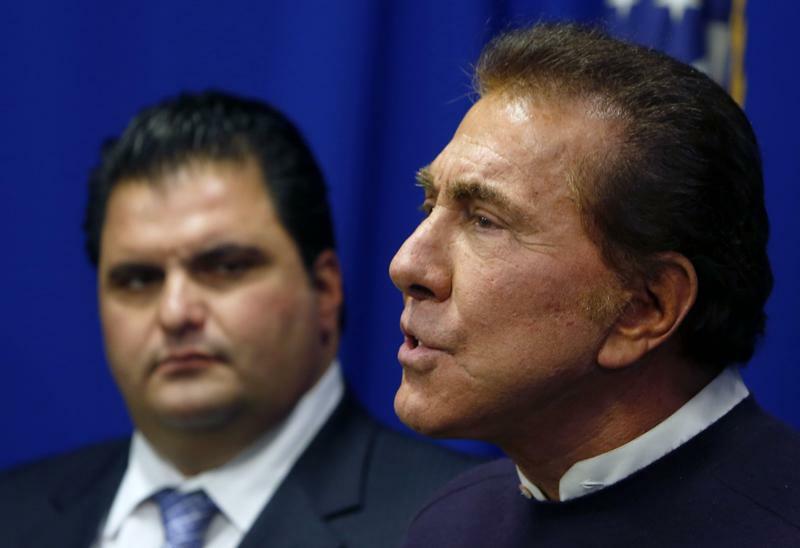 But that history isn’t stopping state Senator Lou D’Allesandro, a longtime casino proponent. This week marks the end of an era in Salem. After opening its doors 110 years ago, Rockingham Park closes Wednesday. Live horse racing ended at the iconic track in 2010, and the park was considered a potential site for New Hampshire’s first casino. A bill that would have legalized casino gambling in New Hampshire fell flat once again in the state Senate. If signed into law, the bill would have legalized video lottery games at a single location in the state. Originally the measure named Rockingham Park in Salem as the location - but in an effort to gain more votes – a revised bill called for an open bidding process. The Senate meets Thursday morning to weigh in on roughly 30 bills, including one touching a frequent topic at the State House in recent years: gambling. Parents have long used "the birds and the bees" to help explain how babies are made...They'd really have some explaining to do if they looked under the sea. Today, the mating rituals of lobsters, and other examples of love down below. Plus, casinos are dizzying places filled with blinking lights, blaring sounds, and outrageous carpet motifs...all designed to bewilder and seduce gamblers to bet high and lose big. We'll get a behind the scenes look at how casinos work from code words to house superstitions. On The Political Front is our weekly conversation with NHPR's Senior Political Reporter Josh Rogers. This week, a look at the New Hampshire primary and the state budget. So, it’s official: the Democratic presidential primary will include more than just Hillary Clinton. Vermont Senator Bernie Sanders is in the race, and says he’s in it to win. North Country reps were about evenly divided on whether to allow casino gambling, but the division wasn’t along party lines. As NHPR reported on Wednesday the House again rejected casino gambling, killing SB 113 by a vote of 208 to 156. The New Hampshire House has again rejected casino gambling, killing the bill by a vote of 208 to 156. House lawmakers are set to vote Wednesday on a bill to legalize two casinos in the Granite State. New Hampshire is just the latest New England state to look to casino gambling as a way to fill budget holes, raising the question of whether the Northeast gambling market is getting too crowded. Gov. Maggie Hassan says she would likely sign a two-casino bill now before the Legislature if it came to her desk. Hassan's comments on Friday are the first time she's said she would sign the measure and they come two days after she told reporters she doesn't think a market exists for two casinos in the state. Gov. Maggie Hassan says she doesn't think a market exists for two casinos in New Hampshire, as proposed in a bill that has passed the Senate and is now before the House. The House Ways and Means committee has narrowly voted to recommend passage of a bill to authorize casinos in New Hampshire. Before the 11 to 10 vote, committee members exchanged arguments familiar to anyone who’s followed casino debates in the past. Backers like Republican Gary Azarian of Salem said that, in addition to boosting jobs and economic growth, casinos would give the state revenue to fund its priorities without increasing taxes or fees. Like the return of spring crocuses, New Hampshire’s perennial gambling debate is back. Earlier this year, the Senate passed a two-casino bill and sent it to the House, which has been a graveyard for these measures. We’ll find out if this time will be any different and look at how arguments around economic benefits and social costs have played out in other states. Senate President Chuck Morse has repeatedly said he won’t include money derived from unapproved forms of gambling in the senate budget proposal. He reiterated that point as he pitched the casinos -- which could include a total of 5000 slot machines and 240 table games -- to the house ways and means committee. "You know we are going to fund the needs of the people of the state of N.H. in the state budget, but I can assure you the wants are much greater." A key House committee is preparing to take public testimony on a bill that would legalize two casinos in New Hampshire. The House Ways and Means Committee, which has previously rejected casino proposals, will hold a public hearing Tuesday morning. Casino gambling has never won approval in the House, but an endorsement from the committee would improve its chances this year. Senators gave initial approval to legalizing two casinos, giving another shot at life to a perennial New Hampshire issue. The two-casino bill passed the chamber Thursday by a single vote, 13-11, and will now be sent to the House. Casinos have often found support in the Senate but the House has never voted to legalize any casinos. Democratic Gov. Maggie Hassan supports a single casino as a means to bring new, non-tax revenue into the state, but she has not said whether she would sign a bill for two. The state senate Ways and Means Committee will hear a bill that would approve the creation of two casinos this Tuesday morning. Long-time casino champion and sponsor of the bill, Democratic Senator Lou D’Allesandro of Manchester, says this bill has a lot more revenue sharing than past bills. D’Allesandro says the hosting community, neighboring communities, the hosting county and the state health department each get a cut of the revenue. Early figures from the Maine Gambling Control Board show slot machine revenue at the state's two casinos remained nearly flat last year when compared to the previous year. Slot players gambled $459.6 million last year at Hollywood Casino in Bangor, an almost 2 percent decline from the $468.9 million bet in 2013. Exact year-end figures for Oxford Casino won't be available for a few months, but casino managers have told the state that it will pocket $31.5 million after taxes, just $7,600 more than in 2013 when players gambled $677 million on slots there. Gambling money will begin flowing into local government coffers in earnest now that the state's casino law survived an Election Day repeal effort. In the coming weeks, MGM says it will make more than $1 million in community payments to Springfield, where it is building an $800 million resort. The company will also pay over $1.5 million to eight surrounding municipalities by Dec. 6. In a debate Thursday morning on WGIR, Governor Maggie Hassan repeatedly went after Republican Walt Havenstein for a pledge he signed earlier this year with the conservative group Americans for Prosperity. The Massachusetts Gaming Commission has awarded the Boston-area casino license to Wynn Resorts, which plans to build a casino resort in Everett. The Mashpee Wampanoag tribe says it's a step closer to having land placed in trust for a proposed resort casino in Taunton. The U.S. Department of Interior has released a final environmental impact statement on the 151-acre site. The move begins a one-month comment period before the decision is formally recorded. Bay State Gambling Debate: What It Means For N.H.
We're checking in with the ongoing debate over casino projects in Massachusetts and the referendum coming this November on whether to repeal the three-year-old law. We'll also look into how the gambling debate in Massachusetts might impact New Hampshire. Mark Arsenault – Boston Globe reporter who covers casino and gambling issues in Massachusetts. Massachusetts' highest court says voters can decide the fate of the state's casino gambling law. The Supreme Judicial Court ruled Tuesday that a question calling for repeal of the 2011 law can be on the November ballot. The ruling overturns Attorney General Martha Coakley's finding that the proposed ballot question is unconstitutional because it would cause casino developers to lose property without compensation. We're sitting down with a panel of House and Senate leaders to look back on the year in the legislature. It was a year of victories for supporters of Medicaid Expansion, but of disappointment for casino backers and death penalty opponents. And it ended with several major players announcing they’re getting out of the game and retiring from politics. All Things Considered is looking at some of the key bills of the 2014 legislative session – and how they ended up passing or failing to pass. This year's casino debate may have seen some new lines of argument, but the outcome was the same as in years past: casino proposals won support in the State Senate, but came up short in the State House. Reporter Norma Love of the Associated Press explains the dynamic behind this year's casino debate to NHPR's Brady Carlson. Casinos are shaping up to be a key issue in the 2nd Congressional District’s Republican primary. At competing events Monday, several state representatives from Salem who back expanded gaming publicly endorsed GOP candidate Gary Lambert. Meanwhile in Concord, anti-casino activists defended fellow Salem Representative Marilinda Garcia’s vote against a plan to legalize two casinos, despite overwhelming public support in her district. House and Senate negotiators have reached a tentative deal on a bill to tighten rules for table games operated in the name of New Hampshire charities. The House and Senate still must vote on Friday's deal. The bill establishes new financial record-keeping and reporting requirements for charities and deeper background investigations by the attorney general. The bill clarifies the definition of so-called redemption slot machines and the Racing and Charitable Gaming Commission's enforcement authority over them.